The call came after vespers. They had arrived. UPS confirmed delivery with a “quantum email.” Shouldn’t I go to the office and pick them up right now? No, I decided. Not tonight. Wait until morning and relish the delicious anticipation, like a kid waiting until morning to see what Santa Claus left beneath the Christmas tree. But this was no surprise. I knew what these were: two copies of the revised Roman Missal. Renewed by decree of the Most Holy Second Ecumenical Council of the Vatican. Promulgated by authority of Pope Paul VI. And revised at the direction of Blessed John Paul the Great. The next day after Mass I hurried from the chapel to the office — I don’t even think I said “Good morning” — and there they were, wrapped in plastic but with course-cotton satchels to carry them with so they wouldn’t get damaged. I lifted one from the box and with the careful stroke of a letter-opener freed it from the wrapper and laid it open on the desk. At last. Some copies came last month, but had to be returned because the corners got crushed during shipping. I didn’t even have the chance to examine them. Replacements arrived but the ribbons seemed small so the business manager sent them back and ordered volumes with the one-inch gold-lined ones. I didn’t get a chance to look them over either. These ones were here to stay and I wanted to show more people. I presented the books to the office staff, bearing them proudly in my arms, like Moses carrying the stone tablets. I thumbed through the elegant vanilla pages and we savored the color artwork, engravings, and drawings placed throughout the volume that tell the story of God in time as rendered by the greatest artists in Christendom: Antonio Tampesta, Emboli, Van Gogh, Van Dyke, portions of the murals painted by John Nava that are displayed in the Cathedral of Our Lady of the Angels in Los Angeles, works that bring the saints to life like friends. There is history in these pages. I see this formality as part of a rare and important moment in our Church. As a new priest, a member of the class of 2011, I am caught between the old and the new. At the seminary I was trained using the second edition of the Roman Missal, soon to be obsolete. I entered priestly formation in August 2007. Back then my contemporaries and I were made aware of looming changes to what we then definitively referred to as the ‘sacramentary,’ but these revisions seemed difficult to envision. There was so much to study. Four years in any institution, voluntary or otherwise, dragged by like four decades, the length of time since the Missal of Pope Paul VI was promulgated. “With the Lord one day is like a thousand years and a thousand years like one day” (2 Peter 3:8). In no better way did I come to understand this but during seminary. Divine time is inscrutable and impossible for humans to calculate. On this I daily dwelt through the wintry windows of academia. In November 2010 the bishop ordained me to the transitional diaconate, bestowing me with the faculties to preach. I wasted no time in treating the matter of the Missal overhaul, surmising that these changes were significant enough to spend time catechizing from the pulpit. Why hold back? I found that many in the assembly seemed intensely curious and my pastoral supervisor, a voracious reader, took it seriously, consuming a binder filled with hundreds of pages of articles, charts, timelines, and essays provided to the presbyterate. Yet we could not obtain a study edition of the Missal early on because they had been “embargoed” until autumn 2011. Mother Church earnestly desires that all the faithful should be led to that full, conscious, and active participation in liturgical celebrations which is demanded by the very nature of liturgy, and to which the Christian people, ‘a chosen race, a royal priesthood, a holy nation, a redeemed people’ (1 Peter 2:9, 4-5) have a right and obligation by reason of their baptism (14). Dom Gregory had made us memorize this passage but the parishioner wasn’t impressed. She stalked off, but that was the first and only time since last Advent when I heard anybody complain about the changes. In fairness to her, many people might disagree with such aspects of the Church but if they choose to leave then they already have made up their minds to go and they only want a reason to push them over the edge. The professor warned us. Praesent in utero. “Stay in the womb, that is, don’t leave the seminary. If you think it’s rough in here wait until your bishop assigns you to your first parish.” Non sumus modica dolebant. Not a little are we aggrieved. As a writer, I know a magnificent volume when I see one, hold it in my hands, with or without the white gloves. God willing, I will celebrate Mass every day for the rest of my life, and will therefore spend a significant portion of each day poring through these graceful pages fastened within the binding of beauty, truth, freedom, and love. This is more than a book. 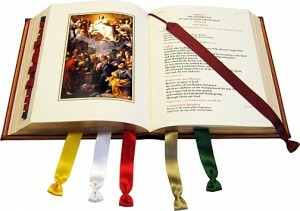 The revised Roman Missal is a key component in the renewal of the American Church, a veritable springtime, as the Holy Father says. We should prepare our communities well and weigh their needs against the fulcrum of the Missal and its potential to balance our growth, which is necessary to survive. Something that doesn’t grow and change can’t survive. Here we grow again. On Friday we have adoration in the chapel. I caught the sacristan in the vestibule on his way out and buttonholed him and gave him the tutorial, entrusted him with a copy. He opened the Missal on one of the side altars and ran his fingers across the black and red lettering on its pages. At first he was speechless. “What’re we going to do with them between now and next month?” he asked. “What do you think?” I trusted his judgment; he has been at this church longer than I have been alive. Collins, John F. A Primer of Ecclesiastical Latin. Washington, D.C.: The Catholic University of America Press, 1985. Sacrosanctum Concilium Second Ecumenical Council of the Vatican 1963. Stelten, Leo F. Dictionary of Ecclesiastical Latin. Peabody, Mass. : Hendrickson Publishing, 1995.